With a topic as complex as SEO, there are bound to be some prevalent myths and misinformation out there. At the rate search and digital culture are changing, understanding SEO requires upkeep; practices that put webpages and businesses in the #1 spot in 2015 may be penalized to page 5 in 2018. 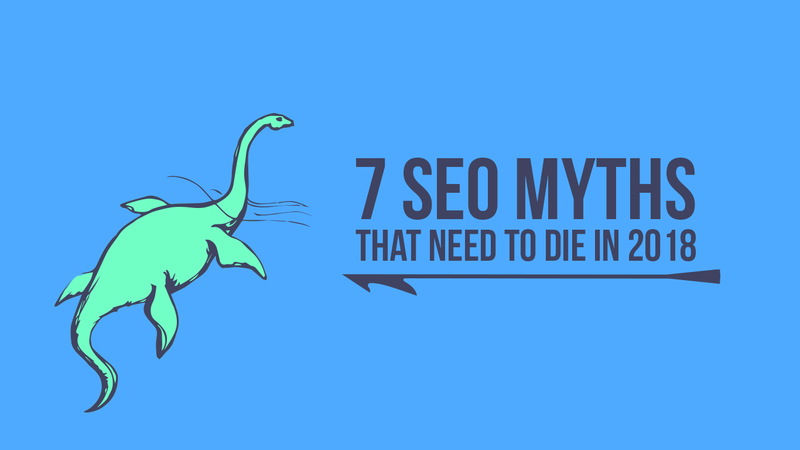 In the immortal words of Jonathan Swift, “Falsehood flies, and the Truth comes limping after it.” Here limps the Truth, to catch and kill seven SEO myths that need to die. I worked in a marketing department in which the CEO demanded daily blogs. 365 days a year. Weekends. Holidays. Forever. A monumental task, with some merits to it. Fill the internet with content, why not? The problem came in the emphasis on quantity over quality. In his perspective, throwing crap at a wall until something sticks and goes viral was the key to SEO. Maybe it was more like hundreds of monkeys on typewriters. Pick your cliche analogy. Needless to say, this rigorous content calendar was a ton of work for our staff, and did little to nothing to improve site rankings. Lesson learned. Low-quality content is often worse than no content at all. Quality is extremely important to Google, and has been since its beginning. Think about it: Google’s #1 job is to get users to what they are looking for. The better your content, the better Google’s user experience is. That’s why spam and deceptive content/practices don’t rank anymore. When creating content, keep Google’s “10X rule” in mind. Larry Page of Google advocates 10X thinking, which means what you create and do should be ten times better than the competition. The mentality is anti-incrementalism, where competitors improve their products and services by 10%. If your content is undeniably ten times better than the competitor’s content, there’s a good chance you will crush the opposition in rankings. The problem? Good content takes time, effort, and (often) money. Pro Tip: Change your focus from amount of content to quality of content. 2017 was a year of compromised web security, inauthentic news, and international hacking. As the internet becomes a more comprehensive part of our lives, we must take extreme caution to ensure our private information is secure. As far back as 2014, Google made site security a ranking factor. In line with trust, authority, and anti-spam advocacy, Google has given sites with SSL (HTTPS) an advantage over sites without SSL. If two sites are completely identical, but one has SSL encryption, the secure site will outrank the unsecured one. It isn’t a huge ranking factor…yet. SEOs are predicting a bigger emphasis on site securityin the near future. Google Chrome is already warning users when a site isn’t secure. Users are very likely to abandon your site if they get this message. Pro Tip: Get SSL encryption and boost site security as soon as possible. For those who don’t know, meta descriptions are little summaries of a webpage’s content that appear beneath the page title and link. It’s sort of like the blurb of a book: few sentences that give a bird’s eye view of the subject, without giving away any juicy details. Like mostly everything on the internet, some attempted to use meta descriptions in a spammy way. It’s more content for Google’s crawlers, right? Wrong. Meta descriptions won’t help your site’s ranking. Officially. That said, there are some best practices for meta descriptions. If they don’t help your ranking, why not just copy/paste the same meta description every time? Though there is much debate on Google’s duplicate content penalty, Google generally filters out duplicate content. Spamminess in general should be avoided. Meta descriptions could potentially hurt your rankings, but they won’t help. Pro Tip: Write informative, concise meta descriptions for the users, and not for search engine crawlers. This shouldn’t come as a surprise to anyone familiar to SEO. The reason it made this list is because keyword stuffing is still prevalent. Webmasters are still stuffing keywords like it’s 1999. Looking for new tires? Fakesite.com has all the new tires and new tires accessories a new tires seeker could ever want! Call today for new tires in your area! NEW TIRES! Does that seem natural to read aloud? No. Does it help rankings? No. Does it sell new tires? No. Does it make the internet worse? Yes. Pro Tip: Use keywords in a natural way. Users (and search engines) are looking for relevant, quality content, and not repetitive drivel. When it hit the search scene, Google’s PageRank eigenvalue algorithm made a huge splash. Its system of weighting and damping factors to establish relevancy of its index made other search engines obsolete almost immediately. That said, Google’s Algorithm has evolved. A lot. PageRank set the stage for future advancements, and a lot of SEOs believe the original PageRank algorithm is still a part of Google’s core algorithm. SEO experts unanimously agree that PageRank’s role in ranking is severely diminished. Users figured out how to manipulate PageRank’s algorithm. The internet has become more sophisticated, and currently, Google’s core algorithm is updated at least daily. PageRank got a lot of publicity. Google doesn’t like to disclose too much about its algorithm. Think of PageRank like a Ford Model T: a game-changing technology that has become obsolete by today’s standards. Still remarkable, with elements in common with the modern iteration, but an ancient novelty. Pro Tip: Stop living in the past. Look at more modern Google updates like Hummingbird, Pigeon, and RankBrain for SEO cues. Comments, social shares, linkbacks, and engagement are generally good… with an asterisk. The insatiable hunger for engagement can lead some folks down a path of evil. More likes equals better exposure, so why not buy interaction? Believe it or not, there are farms for likes, content, reviews, followers, and clicks. Some are automated machines, some are bits of code, and some are people working in dystopian new-age digital sweatshops. 30 to 40 percent of Facebook likes are processed in Bangladesh, where $50 can get you around 1,000 likes. It’s pretty obvious when likes are fake. A seldom-updated page with tens of thousands of likes, but zero engagement is a huge red flag. A sudden spike of thousands of likes out of the blue? Accruing legitimate fans is generally a slow-and-steady climb, and not a spastic, unnatural lurch. As fake interactions have become more sophisticated, the pressure is on tech leaders to moderate and weed out fake content and interaction. Recently, Facebook, Twitter, and Google have come under scrutiny from the Senate Intelligence Committee for their platforms’ role in the spreading of fake news from Russia. You can imagine cracking down on fake engagement will be a major priority in tech in the coming years. Even if hard rules about fake engagement aren’t in place, inauthentic behavior damages trust for your brand. Though it may be tempting to surge your brand artificially, it will catch up with you, and hurt your brand in the long run. Pro Tip: Again, quality is key. Form real relationships on the internet, and foster real engagement. It can be hard to communicate the real value of good content. That may be the understatement of the year. Business owners are used to stripping down costs and identifying redundancies to make budgets sustainable, and content may be the very last priority. Content advocates and creators are often dismissed as artsy-fartsy dreamers with no tangible value (it hurts my feelings to this day). In all reality, content marketing has measurable, effective results. Content isn’t just blog-writing and little tweets and quirky videos. In the words of Ian Lurie of Portent, “Content is anything that communicates a message to the audience. Anything.” The internet is made of content. It’s what everyone consumes and interacts with from sunrise to long after sunset. Making outstanding content gets your brand into the lives of your audience. Blogging establishes expertise in your industry, and (hopefully) gets links all over the place. Blogs actually generate sales leads. Site traffic, improved SEO, direct customer conversions, and immersion with your brand all come from blog content. Video content is probably taking over your video feed, and it’s only going to get more popular. Cisco predicts 80% of global internet consumption will be video content by 2019. If you’re not making good video content, your business will very likely be left in the dust of your competition. Pro Tip: Every business can benefit from content marketing. Just make sure you’re doing it right! Focus on content quality. Keep your site secure. Meta descriptions are for visitors, not crawlers. Don’t be spammy. Stay current with SEO trends. Fake engagement hurts your brand. Content is more important than ever. In general, authenticity is the best policy in SEO strategy. Your content should be a robust resource for your audience, and spammy “hacks” and shortcuts will only make people think less of your brand. Sometimes webmasters, business owners, and content creators can forget that they are cultivating web content for human experiences, and not to appease search engine crawlers. Keep your website current, real, and secure, and your web presence will flourish.